This casual, fine-dining BYO restaurant takes the open-kitchen concept to a new level, providing views of the action from inside as well as out. 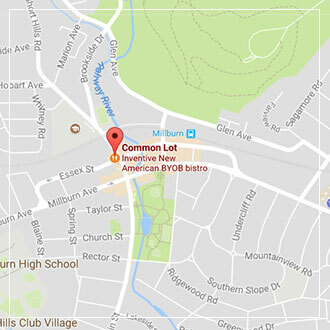 One of the most anticipated restaurant openings this year is Common Lot, at 27 Main Street, Millburn (973-467-0494), which will be opening tomorrow, March 29, by Australian-born chef Ehren Ryan and his Austrian wife, Nadine. This casual, fine-dining BYO restaurant takes the open-kitchen concept to a new level, providing views of the action from inside as well as out—the latter through large plate-glass, street-level windows. Menu highlights include small plates of egg and crisps in a bag; roasted heirloom carrots with honey, cumin, yogurt and pumpkin seeds; salmon sashimi, pickled kohlrabi, crispy garlic and lime and chili dressing; and hasselback potato cooked in lamb fat with burrata and onion marmalade. Big plates include roasted bass fillet with cauliflower purée, Puy lentils, Madeira and truffle sauce; braised duck leg ragu with house-made gnocchi and preserved lemon ricotta; in house dry-aged rib eye with Brussels sprouts, chunky potato chips and mushroom ketchup and 12-hour braised lamb shoulder ‘san choy bow’ style, with iceberg lettuce, cashews, brown rice and soy caramel (for two). 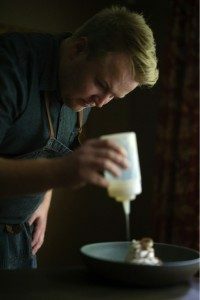 Chef Ryan’s life and career has taken him from his native Australia to India, the Philippines, Hong Kong, Canada, the Channel Islands, Austria, England and now the U.S. The Common Lot menu reflects these global influences while sourcing the freshest ingredients available from nearby purveyors like Urbana Greens, Mosefund Farm and No. Six Depot Roastery and Cafe. His wife, Nadine, a cheese sommelier and expert in the art of tea-making, is a restaurant manager, who studied front-of-house restaurant management at the Hotel Management School in her native Austria. Common Lot will seat 34 on the main level w/an additional 28 in the upstairs dining room. The restaurant will initially open for dinner Tuesday-Saturday. The Kitchen Pass is an exclusive four-seat counter directly overlooking the kitchen similar to a Chef’s table, where the diner purchases the seat for the evening and is served dishes of the chef’s choosing. The Ryans worked closely with Short Hills design collective Studio 1200 on renovating the property to better represent town history. For example, the brick exterior was chosen to reflect the mills that are the origin of the town’s name, while blending in with nearby landmark buildings from the early-20th century.